If the temperature inside the car is too high, open the car windows to ventilate before using the system. It is illegal to copy and use MP3/WMA files without permission. Use CDs that are created only by lawful means. Do not apply volatile agents, such as benzene and thinner, normal cleaners and magnetic sprays made for analogue disc onto CDs. To prevent the disc surface from getting damaged, hold CDs by the edges or the center hole only. Clean the disc surface with a piece of soft cloth before playback (wipe it from the center to the outside edge). Do not damage the disc surface or attach pieces of sticky tape or paper. Make certain only CDs are inserted into the CD player (Do not insert more than one CD at a time). Keep CDs in their cases after use to protect them from scratches or dirt. 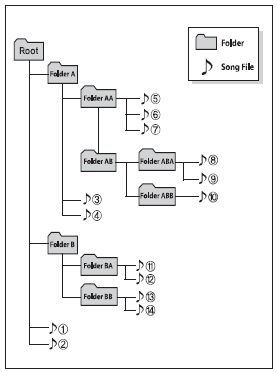 Depending on the type of CDR/ CD-RW CDs, certain CDs may not operate normally according to the manufacturing companies. In such circumstances, continued use may cause malfunctions to your audio system. Some copy protected CDs, which do not comply with international audio CD standards (Red Book), may not play on your car audio. Please note that inabilities to properly play a copy protected CD may indicate that the CD is defective, not the CD player. 1. Song playing order : to sequentially. ❋ If no song file is contained in the folder, that folder is not displayed. Do not stare at the screen while driving. Staring at the screen for prolonged periods of time could lead to traffic accidents. Do not disassemble, assemble, or modify the audio system. Such acts could result in accidents, fire, or electric shock. Using the phone while driving may lead to a lack of attention of traffic conditions and increase the likelihood of accidents. Use the phone feature after parking the vehicle. Heed caution not to spill water or introduce foreign objects into the device. Such acts could lead to smoke, fire, or product malfunction. Please refrain from use if the screen is blank or no sound can be heard as these signs may indicate product malfunction. Continued use in such conditions could lead to accidents(fires, electric shock) or product malfunctions. Do not touch the antenna during thunder or lightening as such acts may lead to lightning induced electric shock. Do not stop or park in parking- restricted areas to operate the product. Such acts could lead to traffic accidents. Use the system with the vehicle ignition turned on. Prolonged use with the ignition turned off could result in battery discharge. Operating the device while driving could lead to accidents due to a lack of attention to external surroundings. First park the vehicle before operating the device. Adjust the volume to levels that allow the driver to hear sounds from outside of the vehicle. Driving in a state where external sounds cannot be heard may lead to accidents. If you want to change the position of device installation, please inquire with your place of purchase or service maintenance center. Technical expertise is required to install or disassemble the device. Turn on the car ignition before using this device. Do not operate the audio system for long periods of time with the ignition turned off as such operations may lead to battery discharge. Do not subject the device to severe shock or impact. Direct pressure onto the front side of the monitor may cause damage to the LCD or touch screen. Do not place beverages close to the audio system. Spilling beverages may lead to system malfunction. In case of product malfunction, please contact your place of purchase or After Service center. Placing the audio system within an electromagnetic environment may result in noise interference. To use an external USB device, make sure the device is not connected when starting up the vehicle. Connect the device after starting up. If the engine is started up or turned off while the external USB device is connected, the external USB device may not work. The System may not play unauthenticated MP3 or WMAfiles. 1) It can only play MP3 files with the compression rate between 8Kbps~320Kbps. 2) It can only play WMA music files with the compression rate between 8Kbps~320Kbps. Take precautions for static electricity when connecting or disconnecting the external USB device. An encrypted MP3 PLAYER is not recognizable. Depending on the condition of the external USB device, the connected external USB device can be unrecognizable. When the formatted byte/sector setting of External USB device is not either 512BYTE or 2048BYTE, then the device will not be recognized. Use only a USB device formatted to FAT 12/16/32. USB devices without USB I/F authentication may not be recognizable. Make sure the USB connection terminal does not come in contact with the human body or other objects. If you repeatedly connect or disconnect the USB device in a short period of time, it may break the device. You may hear a strange noise when connecting or disconnecting a USB device. Depending on the type and capacity of the external USB device or the type of the files stored in the device, there is a difference in the time taken for recognition of the device. Do not use the USB device for purposes other than playing music files. Playing videos through the USB is not supported. Use of USB accessories such as rechargers or heaters using USB I/F may lower performance or cause trouble. If you use devices such as a USB hub purchased separately, the vehicle’s audio system may not recognize the USB device. In that case, connect the USB device directly to the multimedia terminal of the vehicle. If the USB device is divided by logical drives, only the music files on the highest-priority drive are recognized by car audio. Devices such as MP3 Player/ Cellular phone/Digital camera can be unrecognizable by standard USB I/F can be unrecognizable. Charging through the USB may not be supported in some mobile devices. Some USB flash memory readers (such as CF, SD, micro SD, etc.) or external-HDD type devices can be unrecognizable. Music files protected by DRM (DIGITAL RIGHTS MANAGEMENT) are not recognizable. The data in the USB memory may be lost while using this audio. Always back up important data on a personal storage device. Please avoid using USB memory products which can be used as key chains or cellular phone accessories as they could cause damage to the USB jack. Please make certain only to use plug type connector products. Some iPod devices, such as the iPhone, can be connected through the Bluetooth®Wireless Technology interface. The device must have audio Bluetooth® Wireless Technology capability (such as for stereo headphone Bluetooth® Wireless Technology ). The device can play, but it will not be controlled by the audio system. To use iPod features within the audio, use the cable provided upon purchasing an iPod device. Skipping or improper operation may occur depending on the characteristics of your iPod/Phone device. If your iPhone is connected to both the Bluetooth® Wireless Technology and USB, the sound may not be properly played. In your iPhone, select the Dock connector or Bluetooth® Wireless Technology to change the sound output (source). When connecting iPod with the iPod Power Cable, insert the connector to the multimedia socket completely. If not inserted completely, communications between iPod and audio may be interrupted. When adjusting the sound effects of the iPod and the audio system, the sound effects of both devices will overlap and might reduce or distort the quality of the sound. When not using iPod with car audio, detach the iPod cable from iPod. Otherwise, iPod may remain in accessory mode, and may not work properly.